GoPro has its own terminology to explain its camera qualities; these devices are named with specific conventions that users need to understand. The label Black indicates top end model of GoPro family, it possesses much higher picture and video quality and hence is preferably used by professionals but at the same time the price range is also a bit higher. On the other side, the Silver label defines the series for prosumers- the people who have skills to record amazing videos with action cameras. So your device selection must vary accordingly. If we talk about GoPro session then it is one of the smallest as well as simplest action camera units with basic switches. It's simple on and off buttons can assist users in fast switching between recording functions. And the best part is that you can also control these devices via mobile phones using dedicated applications. In terms of frame rate and resolution, this camera use to have smallest specs ratings but the price is again low; such devices are preferably used by consumers who wish to capture trouble free scenes. In this article, we are going to make a complete comparison about GoPro Hero4 Black and Hero4 Silver to help you make a better choice. 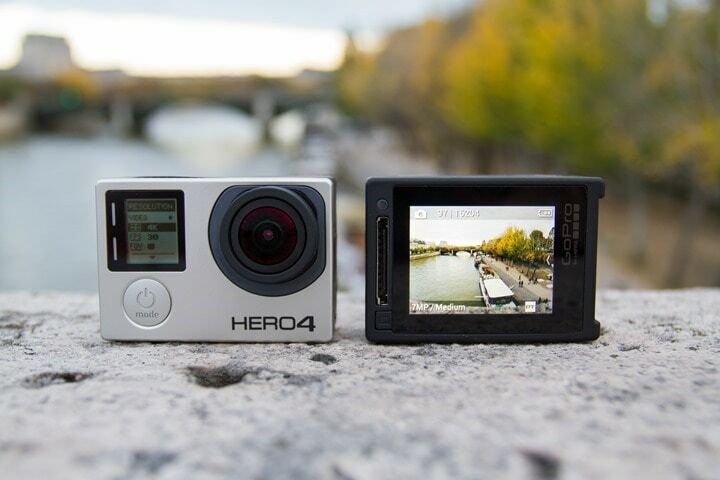 Once you pick your camera in hand you will find the difference, the GoPro Hero4 Silver is the first camera in this series that possess built in type touch screen LCD. It helps users to view whatever they are recording and at the same time provides easy navigation options with the touch panel. Thus this device is very handy for framing different shots, checking previews and for reviewing photos or video footages. The disadvantage of this touch screen type LCD panel is that it causes very fast decay in battery as compared to the other unit that does not have touch screen panel. The GoPro Black does not have built in LCD panel but it possesses wide angle type lenses that assist users in efficient recording. The photo playback as well as video preview is also easier to watch. Both these cameras- Hero4 Silver and Hero4 Black are almost of same dimensions and users can pack them inside same housing during under water shooting. If we talk about weight then the black edition is observed to be little heavier but the maximum weight difference could be just around 5 grams or below 0.2 ounces. The still photos are again almost same as both these devices possess 12MP quality for pictures. Both these cameras can be also adjusted for 5MP and 7MP modes as per need. In this mode selection process, the 12MP resolution serves users with wide FOV whereas in case of 7MP and 5MP you can avail medium level resolution. Hero4 Black as well as Hero4 Silver; both serves with impressive video quality as they can shoot full HD videos and camera resolution varies up to 4K value. Being the higher end device, naturally you will find Hero4 Black much better for shooting immersive content due to the one major feature difference that is black allows video recording at 60Mbps whereas with silver you can achieve recording speed only up to 45Mbps. Most of specifications of both these camera units are almost same so that audio quality is also rated to be almost equivalent. The Black as well as Silver use to initiate recordings at 48 KHz frequency range with advanced AAC compression technology. The automatic gain control mechanism along with internal multi band type compressor is available for overall sound improvement. The mono internal microphones can be attached to both these devices as well as the external microphones can be plugged in via 3.5mm audio jack to mini USB type adapter. One of the major differences between both is in their high end audio. The black unit use to possess an advanced analog to digital converter so that much better audio quality can be generated but this studio level audio quality will not work with your silver unit. The price range of GoPro Hero4 Black is $325.00 whereas for Silver you need to pay only $220. Most of the features are comparatively equal so it is good to decide your product as per your budget.